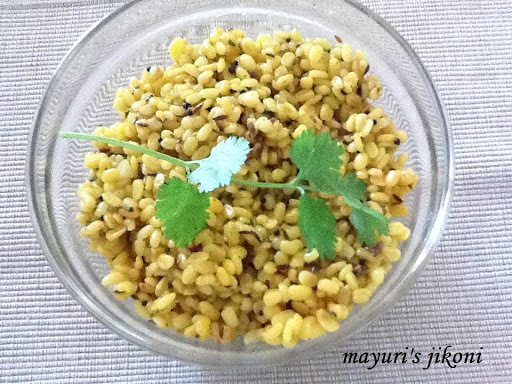 Split yellow moong dal can be made in different manners to suit your palate. It’s a very versatile grain used in curries, to make khichdi, as a filling for indian snacks, cooked with vegetables or on its own. I love making dry moong dal to go with kadhi and rice. Usually there is more of dry moong dal, kadhi and less rice in my plate. Kids too love this dish. Go on try it out. Or have it with chapattis. The choice is yours. Soak the dal or lentils in warm water for half an hour. When they begin to splutter, add the chopped garlic. Add turmeric powder, ginger, green chilli paste and the lentils. Add salt and water. Mix well. Cover the pan and reduce the heat to low. Cook the lentils till done. This will take about 5 to 7 minutes. When done, remove from the pan from the heat. Add the dhana jiru and red chilli powder. Serve hot with rice and kadhi. If the dal is not done in 5 minutes add a bit more water and let it cook. Dhana jiru is readily available in most indian shops. If you want to make it at home, check out the tips section of nunu’s biryani. Can omit garlic and add a pinch of asafoetida. Use it as a filling for toasted sandwich.